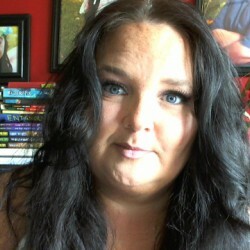 **Review originally posted on www.BunnyCates.com**I will say upfront – I loved this book. There, end of review.HAHA, I’m just kidding. I did love it though. I had borrowed a copy from a friend and then was sad I had to give it back before I could get to it. Luckily, I ended up reading it as my first OFFICIAL read on my kindle. (read my GoodReads status updates) I liked it so much, I fully intend on picking up a hardback copy for my home library. I think it will fit in lovely next to my copy of The Graveyard Book by Neil Gaiman. =DStory wise this book is different and cute. We follow Hansel and Gretel as they adventure through (and become part of) several of the Grimm’s other fairytales. The adventures are dark, as Grimm’s tales should be, but definitely written with children in mind.Writing wise this author has a very Gaiman feel to his work. This book had an excellent pace, great arc, and witty witty rhetoric. (that means the narrator made me L-O-L). I could see reading this one aloud to wide eyed audiences of tweens. The way the narrator interjects and interrupts the story with “warnings” of what is to come was so entertaining. Even to me, as a grown up.I imagine if Lemony Snicket and Neil Gaiman – wrote a book together… It would come out about like this one right here.“Once upon a time, fairy tales were AWESOME!” - Adam Gidwitz, A Tale Dark and Grimm Indeed! It would seem they are becoming so, again! =DI don’t normally give a star rating, but if I were to on this one – I would give it 4/5. (Come on, I can’t 5 it, it’s not the Bible.) Favorite quote from this book:“You see, Hansel and Gretel don’t just show up at the end of this story. They show up. And then they get their heads cut off. 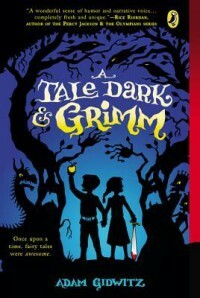 Just thought you’d like to know.” - Adam Gidwitz, A Tale Dark and Grimm *Moms note: this book is considered “gory” by childrens books standards. I did not find it gory at all – but I read horror and slasher books, often. I am a little de-sensitized in that area. You may want to give it a flip through before handing it off to your little ones. There is nothing GRAPHIC, just gory actions (like a beheading etc. not described much in detail but the action itself is in the book.) I have no issues letting my children read this book.